Catchy - Unmatched Performance and Durability! With the successful release and popularity of the their LED Kendama, Catchy is ready to unleash their newest model - Their twist on the traditional wooden kendama - The Catchy Street Kendama! The Catchy Street Kendama may look like your average wooden kendama but it has a completely unique feel and experience that makes it one of the easiest kendamas to learn the basics or master the expert level tricks! The Street tama (the ball) has a sticky rubberized paint that offers increased grip and durability but the ken (not the ball) is where Catchy added their personal twist! The ken is very unique - It was specially designed with slightly oversized cups to give you an extra edge on cup catches and cup-based balance tricks. And take a look at that hole in the bottom cup, that's no mistake! The drilled out weight form the bottom cup ensures a perfect weight distribution for the ideal balance through flips and tricky balance maneuvers! 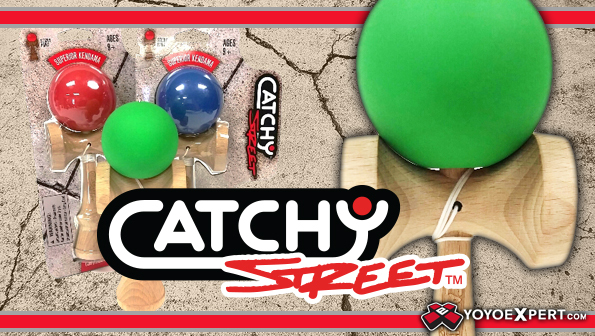 Catchy really impressed us with the performance of their new Street Kendama and we are sure once you try it you will be impressed too!